Such an easy and tasty meal made in your slow cooker. 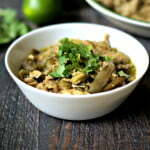 Use this shredded chicken over rice, in tortillas or as is. Add your chicken to the bottom of the slow cooker. On top, add all your tomatillos and banana peppers. In a small bowl, add our lime juice and spices and pour over the chicken and veggies. Let cook on low all day. Mine took 8 hours. Shred chicken and mix well. Server over rice, in tortillas, or as is.